Much has been said about the pros and cons of online activism, but when it comes to keeping fossil fuels in the ground, having protesters on location during leasing auctions has been key in recent years. This tactic could soon be rendered obsolete if the fossil fuel industry, along with many in Congress and the federal government, get their way and make oil and gas leasing auctions exclusively online affairs. Earlier this month, the House Committee on Natural Resources passed a bill that would require lease sales for offshore oil and gas drilling to be held online. At the same time, the Obama administration is helping to shift onshore public lands auctions online after years of unwelcome confrontation with environmental activists—the most familiar of these being a 2008 act of civil disobedience by Tim DeChristopher during an oil and gas drilling rights auction in Utah. DeChristopher entered the auction and started winning bids to drilling rights on more than 150,000 acres of publicly owned Utah wilderness. After winning more than a dozen leases worth more than $2 million—leases he never planned to pay for—DeChristopher was eventually sentenced to two years in federal prison for criminal fraud. The media attention his actions brought to the issue helped make oil and gas leasing one of the main confrontation points between environmentalists and the Obama administration throughout Obama's time in office. "The administration doesn't like us shining a light on Obama's biggest climate failure. That's what we do at auctions." Tim Ream, Climate and Energy Campaign Director with WildEarth Guardians, told me that Obama's "public lands and energy policies completely undermine his climate policy." "The administration doesn't like us shining a light on Obama's biggest climate failure," he said. "That's what we do at auctions." Ream said that since last November, "Keep It In The Ground" protesters—a campaign to protect public lands from drilling—have been at every public lands and waters fossil fuel auction trying to raise awareness for the cause and pressure the administration. "We have to keep 80% of fossil fuels in the ground," he said. "That starts with U.S. public lands and it starts with ending all new leasing." Studies show that phasing out fossil fuel leases on public lands is crucial to keeping climate change within the 2° C temperature increase that most scientists believe is necessary to avoid cataclysmic impacts. To complement the efforts of the on-the-ground protesters, environmental groups recently filed a legal petition with the Department of Interior asking for a moratorium on federal fossil fuels leases. Ream said officials have tried a number of tactics to shake the protesters at auctions, including postponing them, moving locations at the last minute, and shifting locations to more remote areas. He said there have been no arrests though, "for fear of the publicity." Rep. Garret Graves (R-LA), one of the authors of the bill to mandate online auctions for offshore oil and gas leases, said the primary reason for his bill is to “modernize” the Bureau of Ocean Energy Management’s offshore leasing process. “Internet-based oil and gas leasing will open investment opportunities and competition for additional businesses, improve the transparency and efficiency of the process," he said during a legislative hearing. Another way of putting this, according to Friends of the Earth, is that "moving the auctions online serves one purpose: to make it easier for the fossil fuel industry to take control of our public lands, shielded from public scrutiny and input." According to Offshore Magazine, of the 1.7 billion offshore acres, only 1.3%, or 22 million acres, are currently under lease and some 87% of U.S. offshore area is barred from exploration, including the entire Atlantic. Environmentalists have fought hard to keep it this way. As recently as March, the Obama administration changed course and decided not to open Atlantic waters to more oil and gas drilling after activists and coastal residents fought the proposal. New oil and gas drilling in along the U.S. East Coast, which many fear would also have negative local impacts on marine life, fishing, and tourism, has not happened in around 30 years. "The ramp up in lobbying for online auctions is happening because the climate justice movement is growing." Kaitlin Butler, a program director with the Science and Environmental Health Network, told me that "across the country, communities are waking up to the harsh reality that government isn't failing to act on the climate crisis, but in many ways actively participating in exacerbating it." Butler said the "auctions provide a space for the public to hold the government responsible," and that the "ramp up in lobbying for online auctions is happening because the climate justice movement is growing." "Moving auctions online makes it easier for corporations to ignore frontline communities," she said. "It shields the fossil fuel industry from the voices and concerns of the communities who are directly impacted by the extraction projects and by climate disruption." Public lands fossil fuel development has become so contested that it was recently revealed by The Intercept that federal agents have gone undercover to spy on the anti-fracking movement. According to emails released under an open records act request, state and federal agents went undercover among some 300 protesters at a gathering in May in Colorado. According to a statement from Marissa Knodel with Friends of the Earth, this was another "shameful" example of the federal government collaborating with the fossil fuel industry. "Instead of wasting time and resources spying on non-violent citizens, the Obama administration should listen to the people on the front lines of climate change," she said. "Instead of hiding fossil fuel auctions by moving them online, the Obama administration should keep fossil fuels in the ground." Earlier this year, author and environmentalist Terry Tempest Williams bought leasing rights to 1,750 acres of land in Utah to spare it from fossil fuel development. In explaining to the Bureau of Land Management if her bid was legitimate, she responded that "you can’t define what energy is for us. Our energy development is fueling a movement." 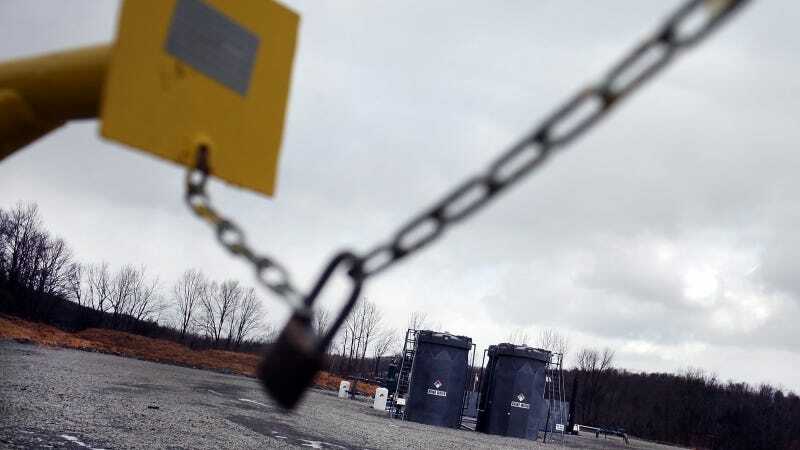 In discussing the experience on Democracy Now!, Tempest said the "lands go up for lease auction, that gives the highest bidder the opportunity to speculate, to drill for oil and make an enormous profit, as we know…It’s oil and gas companies. It’s very secretive. If you talk to them, they won’t tell you who they’re representing." She said the whole process is very emotional and disheartening for her because it turns public lands into something not public at all, but rather makes them available to the highest bidder from a "secret society for oil and gas companies."